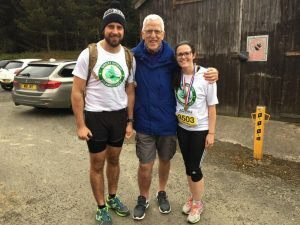 Since the incident, Jim and Mr Holland’s daughters-in-law Kristina Rodney and Shonah Holland ran the Kielder Half Marathon to raise money for GNAAS. To add to the challenge, Jim decided to run with a backpack weighing 15kg, and in total they raised £782 for the charity. Incident location: The A68 near Crook, County Durham (map below). 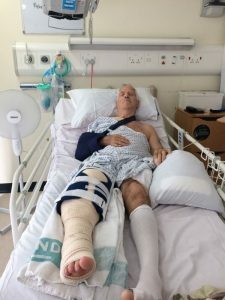 Pete had sustained very serious injuries and was around 20 miles from the nearest Major Trauma Centre. 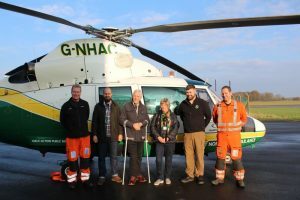 It was imperative that the team reached him quickly and then were able to administer the treatments he needed to stabilise his condition before the transport to hospital. Not only do our aircraft travel at up to 190mph, they also carry on board pre-hospital expert clinicians who can deliver treatments which once would have only been possible in the emergency department.